Cairo was hit with a blast on Monday evening in one of the capital’s dense residential neighbourhoods, which killed at least three policemen and injured others including a number of civilians in a rare strike in the heart of the city. A National Security policeman and two lower-ranking policemen were killed in the explosion in Darb Al-Ahmar neighbourhood. 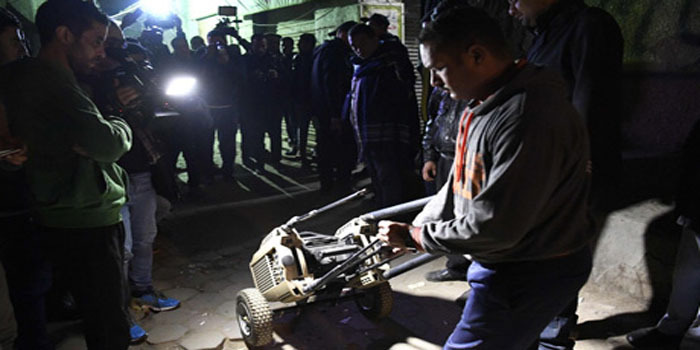 The blast was set off by a suicide bomber when police attempted to apprehend him over his suspected involvement in an earlier attack in Giza. Two other policemen and civilians were injured in the explosion in the crowded area. According to the interior ministry, security forces were on the attacker’s heels over his suspected involvement in an attack on a police patrol in Giza on Friday, which left a number of policemen injured. Shortly after the Darb Al-Ahmar attack, Egyptian state TV and other stations aired a black-and-white photo of the bomber, identified as 37-year-old El-Hassan Abdullah, as well as CCTV footage showing the explosion. The footage shows the suspect, who is riding a bike in a narrow alleyway, being swiftly approached by a policeman before an explosive device is detonated. Another piece of broadcasted CCTV footage shows Abdullah riding his bike in the capital while carrying a backpack, although it is unclear when this footage was recorded. Upon conducting a search of Abdullah’s apartment in Darb El-Ahmar, police found a time bomb, leading them to evacuate the entire building. It is unclear if the bomber has links with any known terrorist groups. Monday’s attack reportedly damaged a number of stores in the area, which is located near the historic and Al-Azhar Mosque, one of Cairo’s favourite hotspots for tourists visiting the populous city. In a statement, Egypt’s antiquities ministry said the blast did not damage any of the historical Islamic sites in the area. This is the first time in years such an attack has taken place in the area. In 2005 and 2009, a number of tourists were killed and injured in explosions in Khan El-Khalili, a popular touristic market in the area. Terrorist attacks in Cairo and Giza are uncommon and have been declining in recent years, with the notable exception of a number of high profile incidents including a deadly attack in 2016 on St Mark’s Cathedral in Cairo. Last January, a policeman was killed as he attempted to defuse a bomb near a church in Cairo’s Nasr City ahead of Christmas Celebrations. Less than a month earlier, three Vietnamese tourists and their Egyptian tour guide were killed in an IED attack on their bus in Giza. One day after the Darb El-Ahmar attack, police said they killed 16 terrorists in North Sinai governorate in two raids on terrorist hideouts. Egypt continues to battle terrorists in the restive North Sinai as part of Operation Sinai 2018, which was launched in February 2018 to eradicate terrorism. Last Saturday, Egypt’s Armed Forces said that 15 of its personnel were killed during an attack on a security checkpoint near El-Arish airport. Seven militants were also killed in the attack.